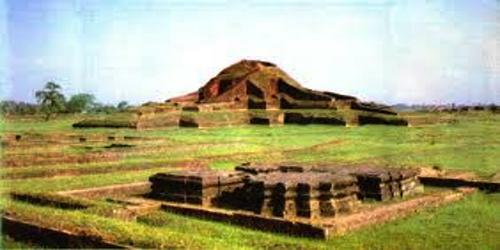 Paharpur an important archaeological site in Bangladesh, situated in a village named Paharpur (Pahadpur) under the Badalgachhi Upazila of Naogaon district. It was declared as a World Heritage site in 1985. The village is connected with the nearby Railway station Jamalganj, the district town Naogaon and Jaipurhat town by metalled roads. It is in the midst of alluvial flat plain of northern Bangladesh. In contrast to the monotonous level of the plain, stands the ruins of the lofty (about 24m high from the surrounding level) ancient temple which was covered with jungle, locally called Pahar or hill from which the palace got the name of Paharpur. It is a small village 5 km west of Jamalganj railway station. Here the remains of the largest known monastery south of the Himalayas have been excavated. This 7th century archaeological find covers approximately an area of 27 acres of land. The entire establishment occupies a quadrangular court measuring more than 900 sq ft and from 12 ft to 15 ft in height. With elaborate gateway complex on the north, there are 45 cells on the north and 44 in each of the other three sides with a total number of 177 rooms. The architecture of the pyramidal cruciform temple is profoundly influenced by those of Southeast Asia, especially Myanmar and Java. 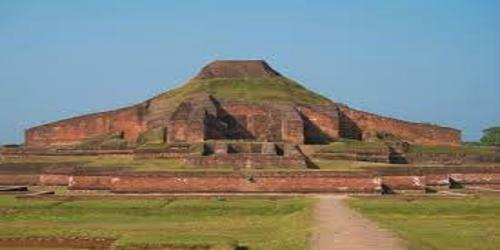 It took its name from a high mound, which looked like pahar or hillock. A site museum built recently houses the representative collection of objects recovered from the area. Buddhism attained its last major developments in India at that time under these Pala Dynasty Kings, who embraced and protected the Buddhist ideals. The successive kings established many Buddhist temples. The Vikrashiya temple in the Bihar State of northern India and the Paharpur Buddhist Vihara were built under the second King Dharmapala. It is said that when Buddhism was the prevailing religion in the area, practicing Buddhist monks gathered in their endeavours for enlightenment, but Buddhism itself was gradually being forced out by the increasing influence of the Hinduism and it started to show signs of decline. The site was first noticed by Buchanon Hamilton in course of his survey in Eastern India between 1807 and 1812. Westmacott next visited it. Sir Alexander Cunningham visited the place in 1879. Cunningham intended to carry out an extensive excavation in the mound. But he was prevented by zamindar of Balihar, the owner of the land. So he had to be satisfied with limited excavation in a small part of the monastic area and top of the central mound. In the latter area he ‘discovered the ruins of a square tower of 6.70m (22 ft) side with a projection in the middle of each side’. The site was declared to be protected by the Archaeological Survey of India in 1919 under the Ancient Monuments Preservation Act of 1904. 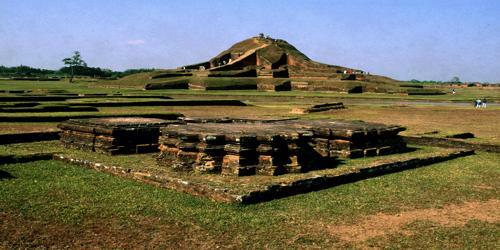 After independence (1971) the department of archaeology of Bangladesh brought the site under further excavation. The operations took place in two phases. The first phase was initiated in 1981-82 and continued in every season up to 1984-1985. The second phase was started in 1988-89 and continued in the next two seasons up to 1990-91. The first phase of excavations was aimed at establishing the three major building phases of the cells that Dikshit mentioned in his excavation report and discovering the information of early levels. But in the second phase the works were confined to clear the cultural debris from the courtyard of the monastery. After a long gap a small-scale excavation was conducted in the temple area and nearby courtyard in 2007-08.